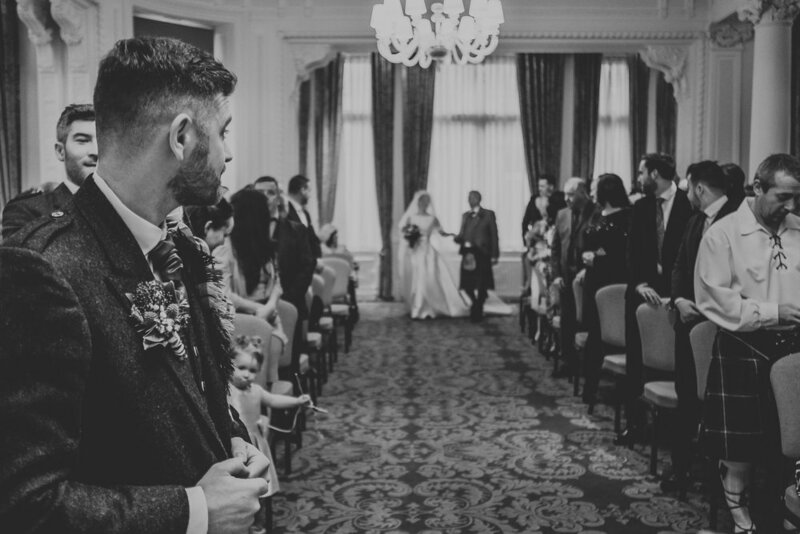 Shauna and Kris’s city centre wedding was held at the Double Tree by Hilton in Liverpool. 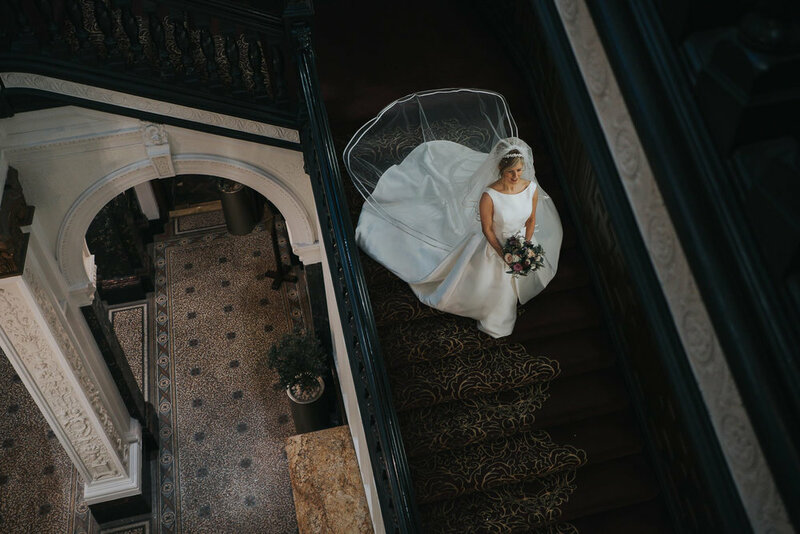 A stunning venue for any city centre wedding with stunning architecture, a beautiful ceremony room and I’d easily say one of the grandest staircases in the whole city! 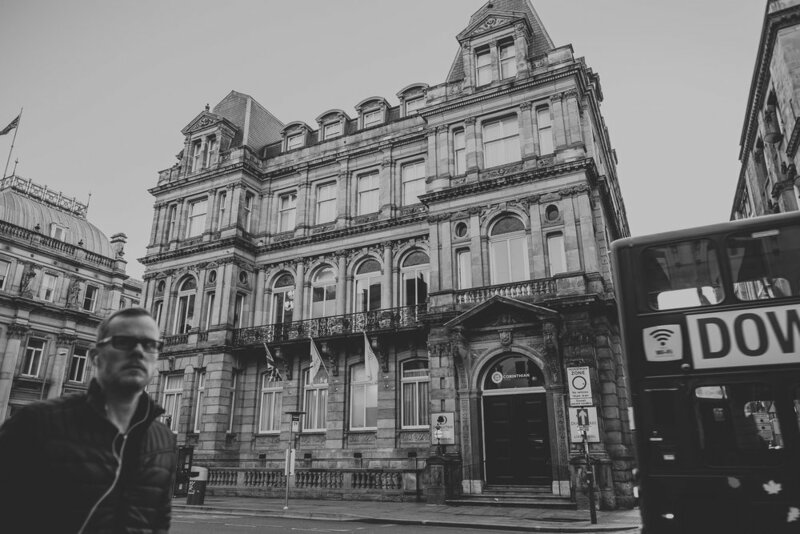 I love the hustle and bustle of city life and with Liverpool being my home city, I feel very honoured when I’m asked to capture a wedding there. 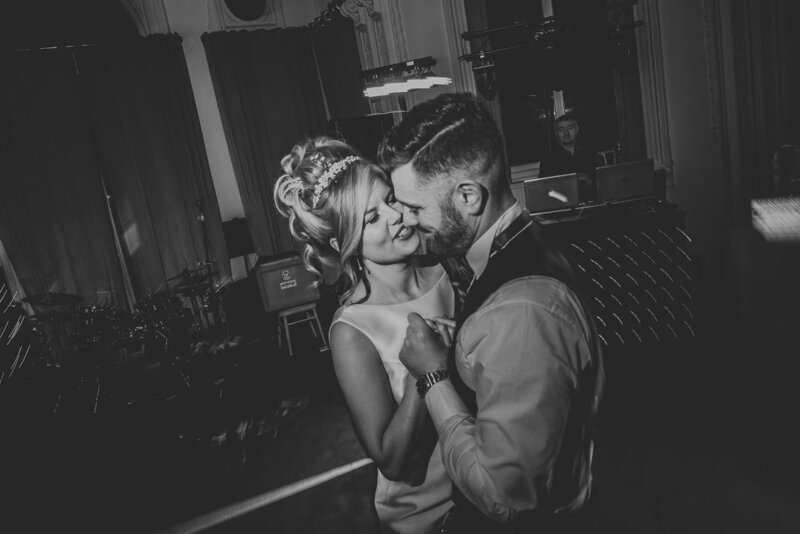 I met Shauna and Kris via Instagram around 18 months before the wedding and we had an instant connection from the start, our photography styles matched perfectly. 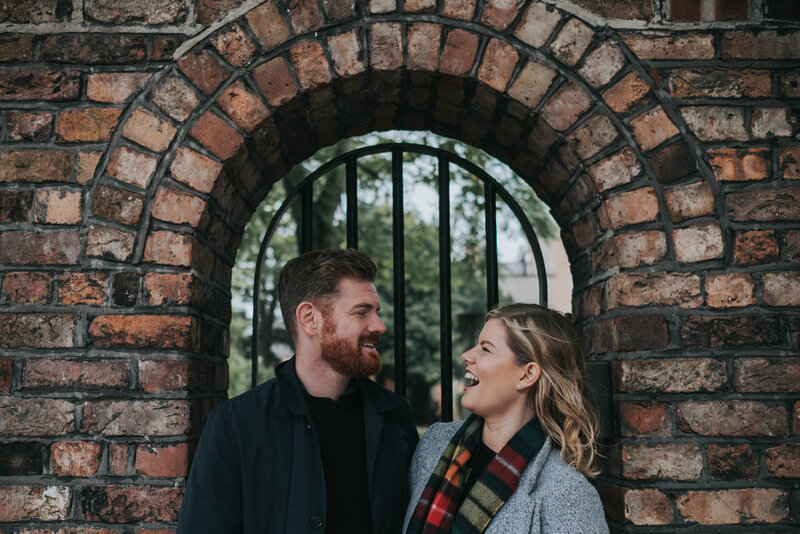 We shot some lovely engagement images round Liverpool a few months before the wedding, and it was a total pleasure to get to know them both that little bit better. 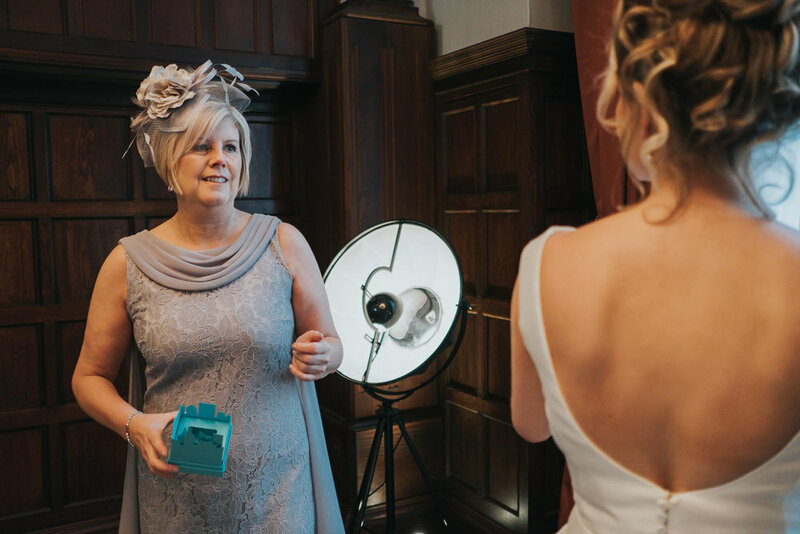 On the wedding day bridal prep started early with Shauna, her bridesmaids Laura and Helen and mother of the bride Ann relaxing in the Presidential Suite of the Double Tree. 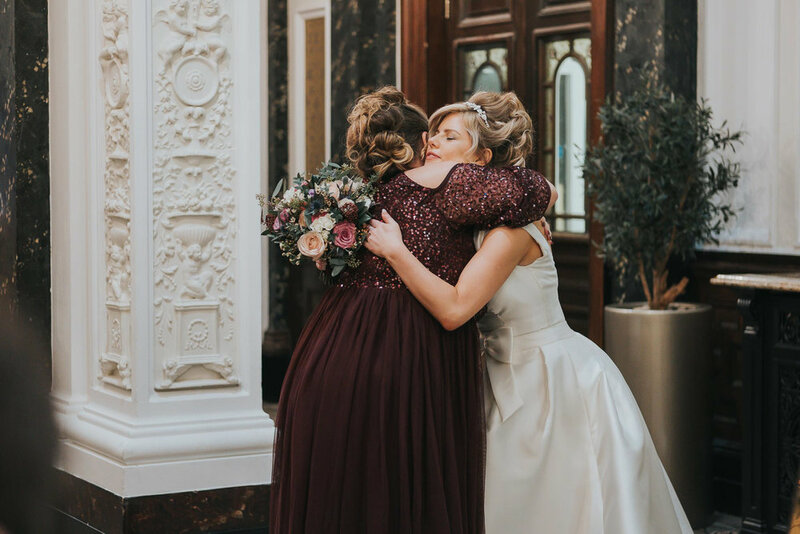 Jeanette Flynn (Make up Artist) and Kathy Griffiths (Hair by Kathleen) were both super organised and blissfully pampering the girls before the big reveal later in the Grand Ceremony Room of the Double Tree. Kris and the boys were over in the Richmond Hotel around the corner from the Double Tree. Sipping on single malt, filling up hip flasks of dutch courage and making sure sporrans and kilts were fitted correctly. A short walk over through the city and Shauna’s man was ready for her big entrance. 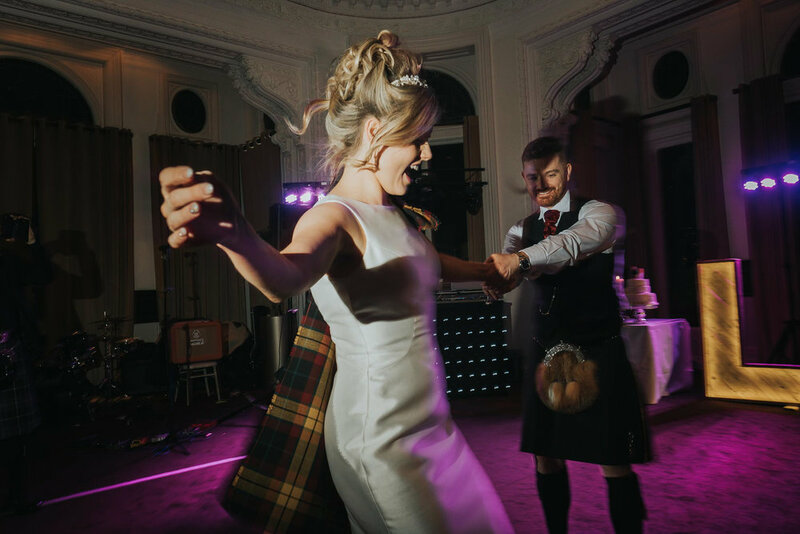 Kilts, Bagpipes and Confetti, what more do you need for a wedding?! 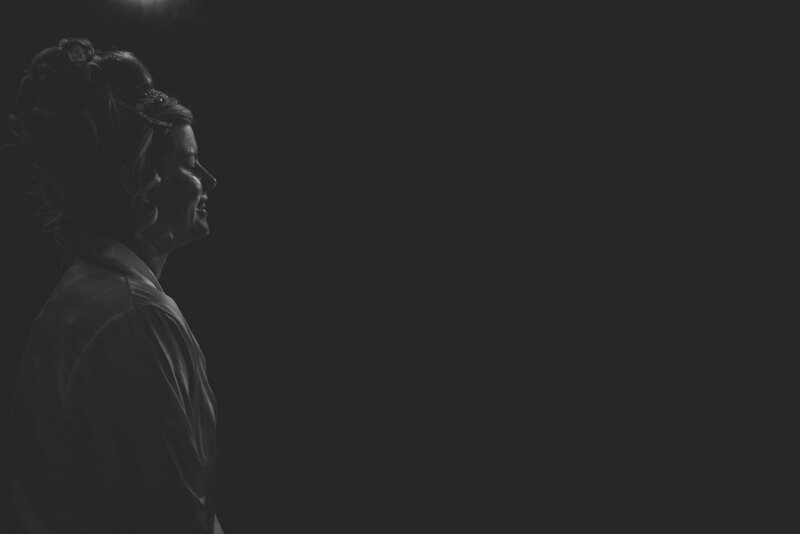 The ceremony was just perfect, Kris patiently waiting at the alter for his bride to turn the corner and walk down the aisle towards him. 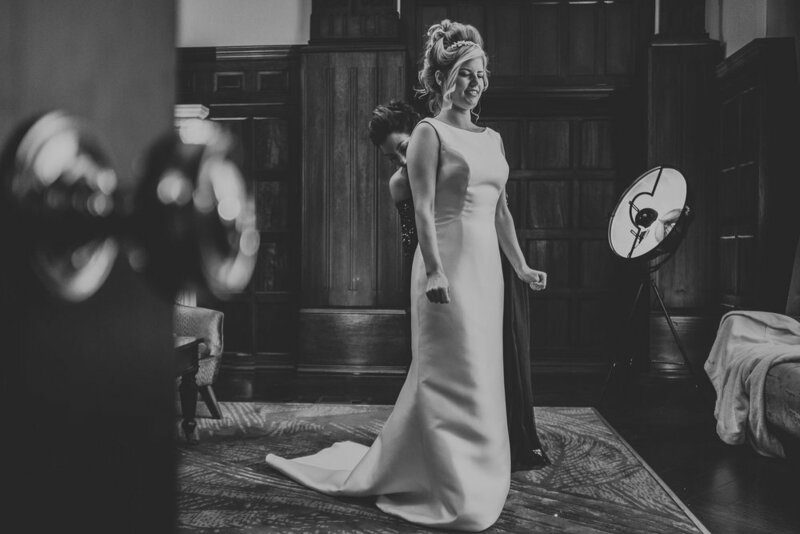 Shauna lightened up the room as she entered in her stunning wedding dress, dad Frank on her arm and traditional bag pipes playing by Phil McConnell. 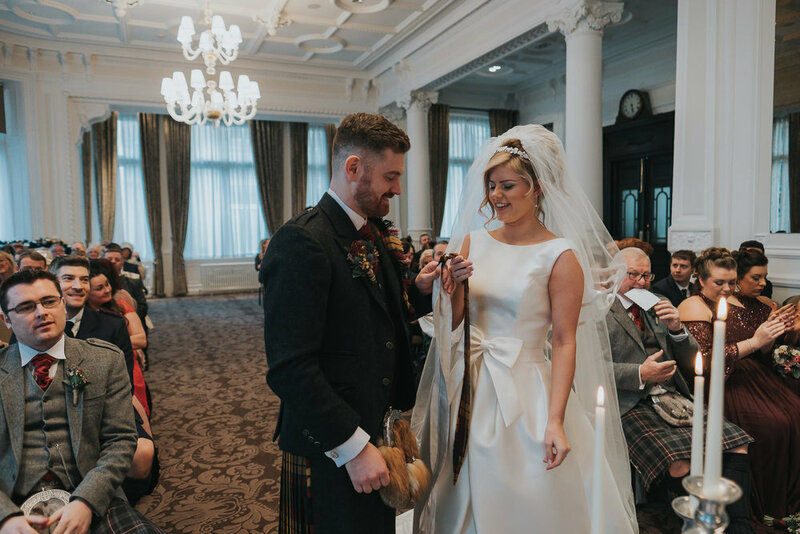 With lighting of the Unity candle and a traditional Scottish hand fasting ceremony it will be a wedding hard to forget. 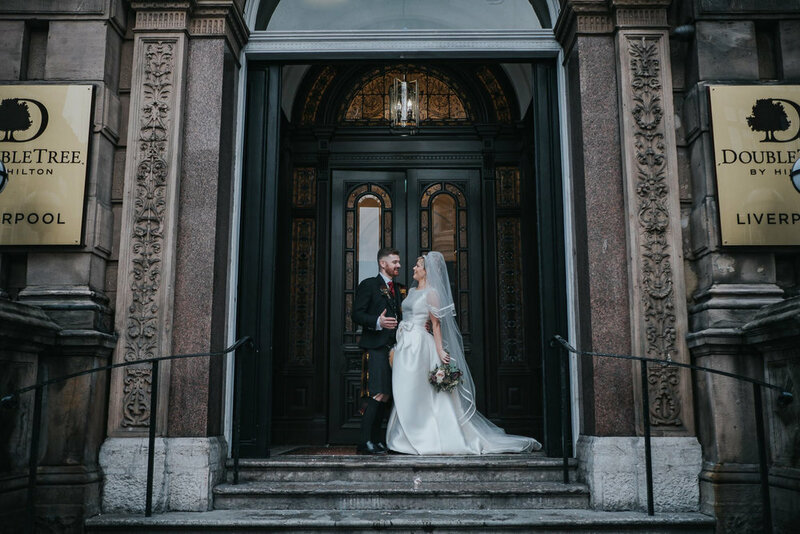 Good old mother nature hit just as we were ready for confetti, so standing in the grand entrance to the Double Tree, family and friends covered both Shauna and Kris from head to toe! 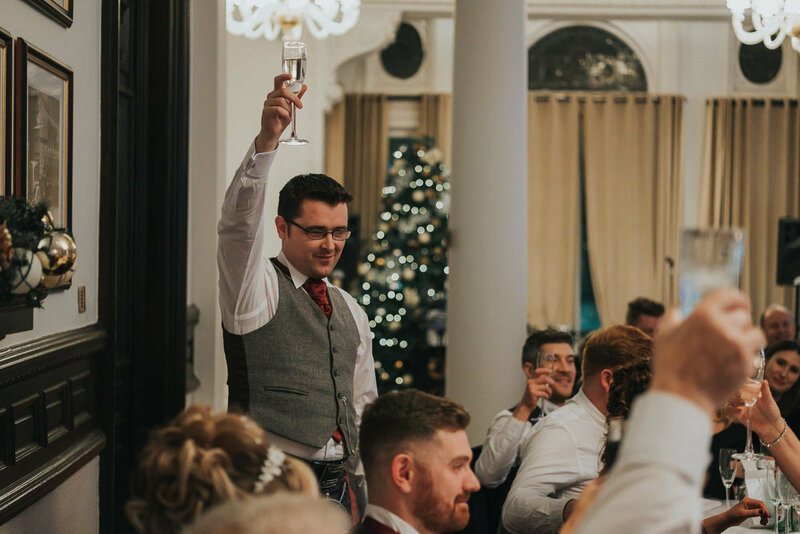 A lovely backing of the old library room and songs from the very talented Kyle Ray was perfect for guests to relax to before a sensational wedding breakfast. Their room was set up beautifully, very rustic with raw log centre pieces, homely flower arrangements and a stunning hand cut wooden LOVE sign finishing off their room perfectly. The last evening of 2017, the first as man and wife. The evening started with a great set from Kyle Ray and his four-piece band Caramel Dragons. Shauna and Kris entered the room with a standing ovation from family and friends. A wondrous first dance followed with guests joining the newlyweds on the dance floor before a heart warming father and bride dance. Thank you so much guys for allowing me to be such a huge part of not only your wedding day but also the run up to it. I feel I have gained two new friends and I hope the relationship we have made can grow hand in hand with the new relationship you both have made becoming man and wife. To all the wonderful vendors whom helped tremendously to make the happy couples day run smoothly, thank you! A huge shout out to my 2nd photographer for the day Nick from Crystal Logic. Thanks buddy, it’s always a pleasure having you by my side! All Shauna and Kris' vendors and their links are below. Lastly... A view of their day from behind the camera! Special Shout out to Nicola Devaney & her incredible team. They really went above and beyond for us and all our guests on the day. For understanding how much every detail meant to us and putting that in to place before hand.